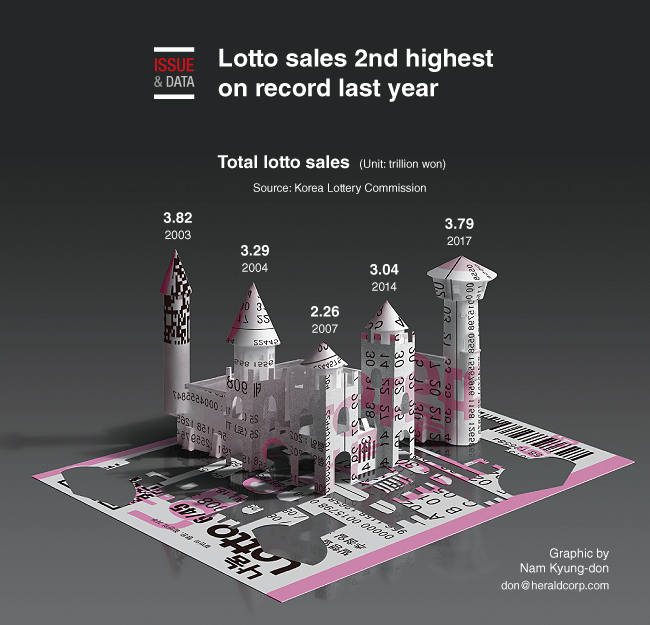 Sales of Lotto tickets hit the second-highest annual number ever last year, the Korea Lottery Commission said. Total sales marked 3.79 trillion won ($3.4 billion) for 2017. The figure comes close to the largest tallied since the country started selling Lotto tickets in 2002. Sales peaked in 2003 at 3.82 trillion won. That number slipped to 3.29 trillion won in 2004, as total sales continued to drop to 2.26 trillion won in 2007 before rebounding to 3.04 trillion won in 2014.